has left me feeling so blessed. I appreciate you all from the bottom of my heart. Thank you for your encouragement to keep writing, creating, and being me! 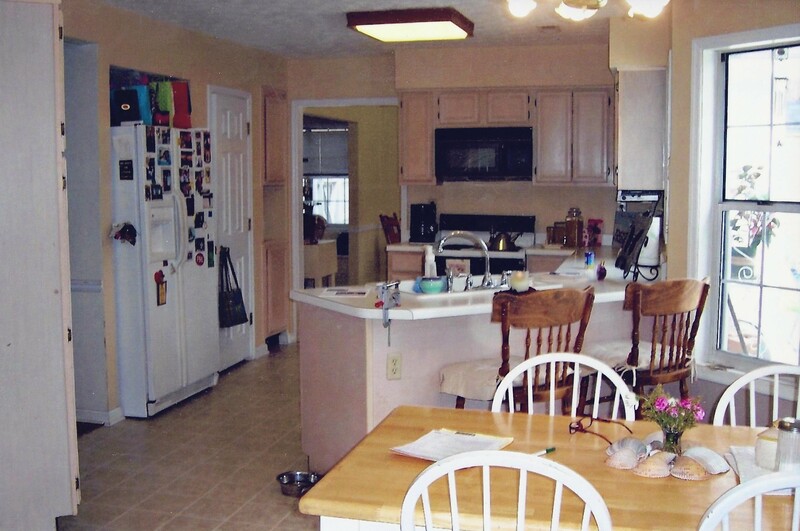 With that said, I wanted to answer your questions regarding my kitchen. Remember when I said there was a lot of Elbow Grease involved? and a pop of contrast with dark floors and counter-tops. 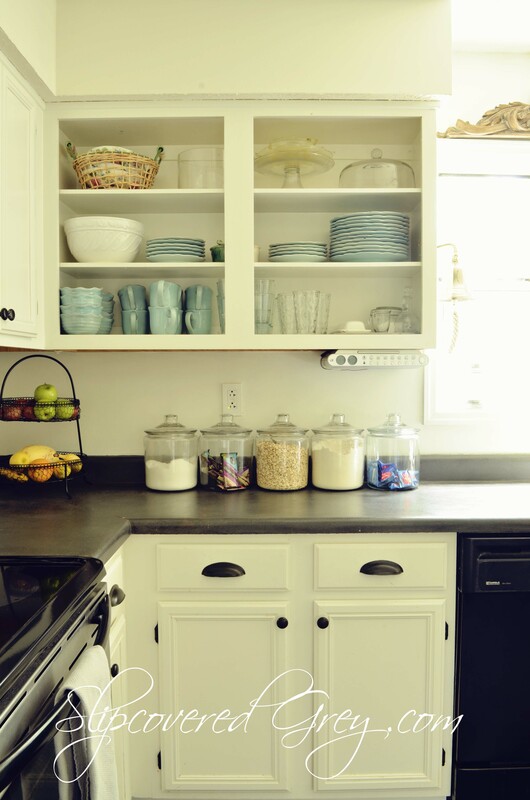 Because the kitchen is small, I wanted open shelving to give the illusion of more space. I also like the fact that it is easy to get to all of my daily dishes without opening and closing cabinet doors. with Benjamin Moore, White Dove. The oven was a Craigslist purchase. The dishwasher remained and is black. (It works great, so until it dies, it will stay). but is laminate by Quick-Step in Dark Wenge Wide Planks. The kitchen peninsula was wrapped in thin wood. and the baseboards were not as wide as I would prefer. 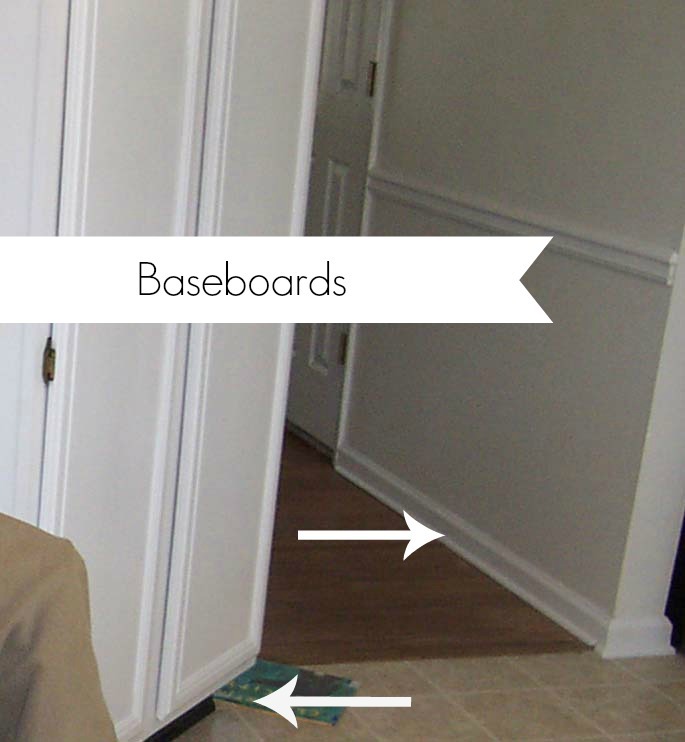 So we added 5 1/4″ baseboards painted in Benjamin Moore, White Dove. I also wanted a chalkboard, so I thought this was the perfect spot. cabinet was built into the wall. I wanted an updated, custom look with the peninsula area. The thin board seemed cheap to me. it doesn’t have to look like it, right? So we added bead-board and framed it out with wood trim. 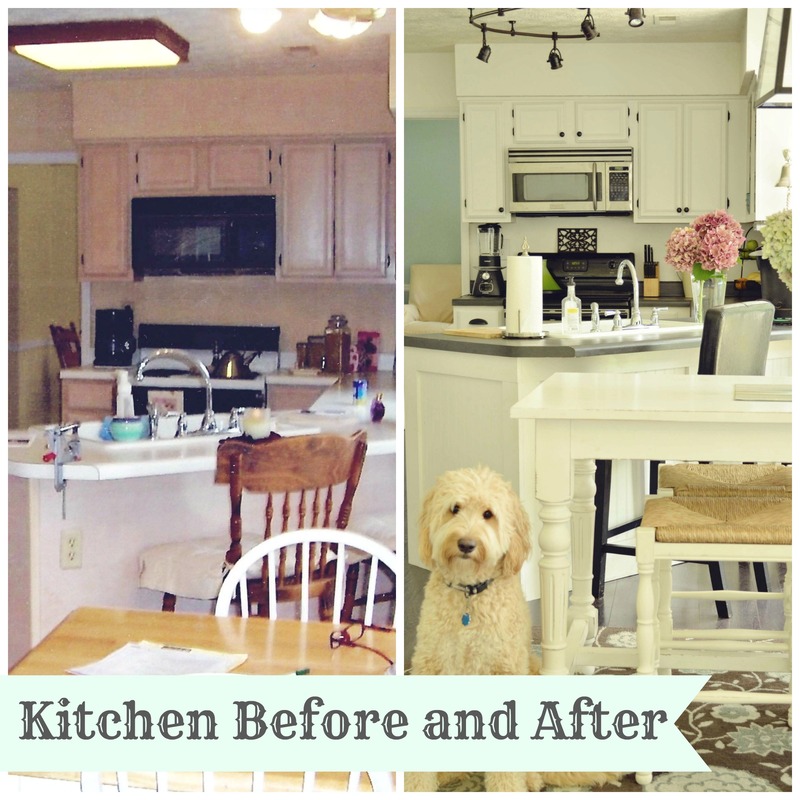 I hope you enjoyed the kitchen before and after transformation! Wow that looks fabulous. Thanks for the inspiration! The new details really pop. I noticed the end of the peninsula even before reading about it. 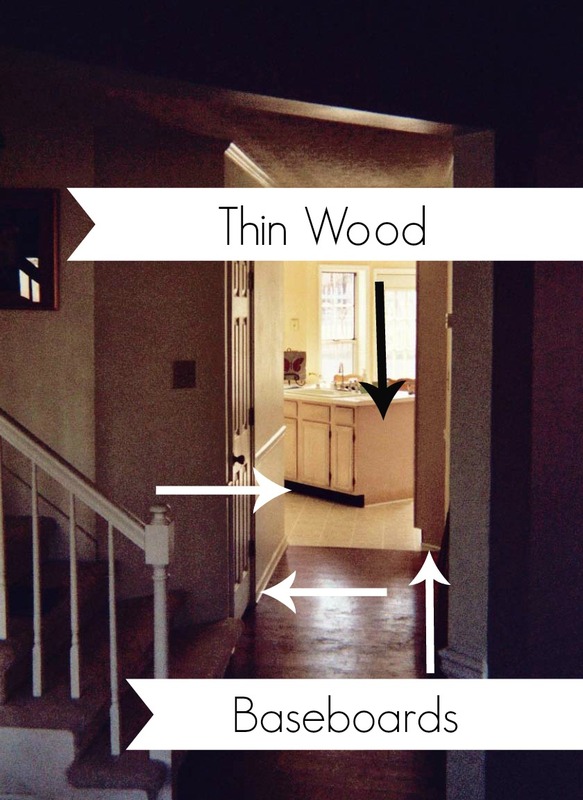 The flooring in a continuous run really enlarges the space and larger baseboards are really attractive. All of your changes would not break the bank but really makes a huge impact. Thanks for sharing and motivating the rest of us to get started on changes in our own spaces rather than waiting for a complete make over. I am a new follower so did your family hire out the work or DIY? Thanks Janet! We moved in almost 7 years ago and tackled the painting etc. right away. We did this ourselves with the help of my mom and dad. We did hire out someone to do the peninsula and some of the baseboards, but after that, we decided we could have done it ourselves. I am lucky because my father-in-law is a handyman, he helped us install the flooring, a couple of doors, etc., he has been a huge help. My husband and I have learned a lot and now we try to tackle it all ourselves. This looks so fabulous! Did you prime too and what did you use? Did you use a foam roller? Did you clear coat the top? How is it holding up? Thanks Pat! We sanded and primed before painting. We used a high quality brush for both. A clear top was not used, but we used a semi-gloss so it would hold up better. It is holding up great, we do have to touch up sometimes around the door handles in the corners, but overall, it has held up great! Thanks Angie! Did you use latex based paint or oil? I have all these questions because I’d like to try this myself so just want to get all the steps right. I love your kitchen! We are about 2/3 of the way done with redoing ours, with Ikea cabinets. The floor still has to be done (we’re doing a lighter one than yours), and all the miscellaneous trim work and a little touchup painting. We also have white cabinets and black countertops (ours is Ikea Pragel in Mineral Effect Black, which I picked out in about 30 seconds because the birch I had been planning on was out of stock in three states). I have been looking at the track lighting fixture that you used for months, now. I love the way it looks but I don’t know how well it lights… what’s your opinion? Do you also have pot lights? I currently have a chandelier that holds six, count ’em, six regular light bulbs, and that’s really most of the light in the kitchen. Thank you! 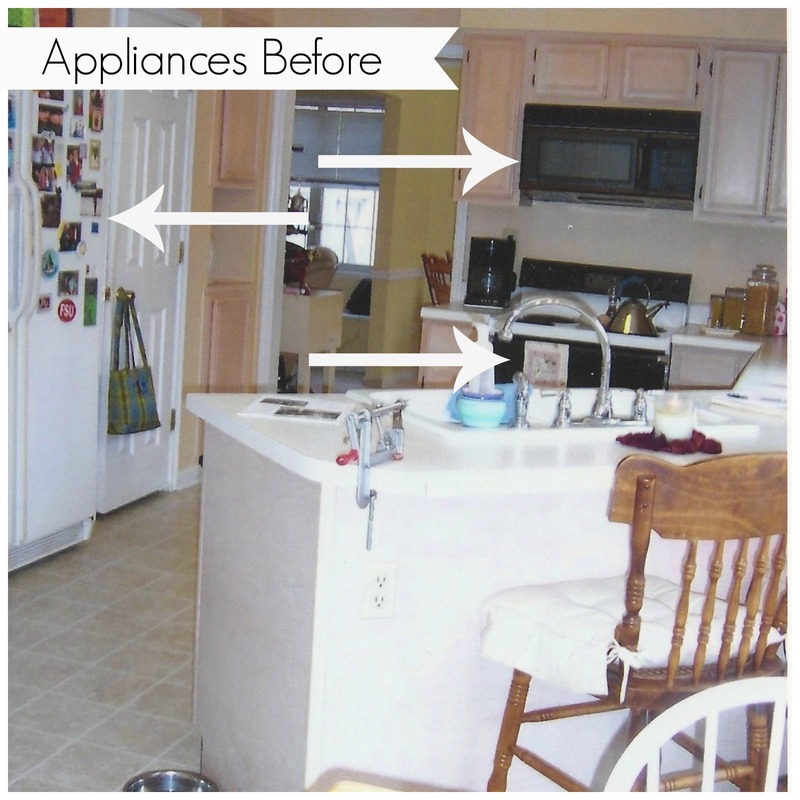 Your kitchen sounds like it is going to be AMAZING! I hope you will send me a picture when you are finished. 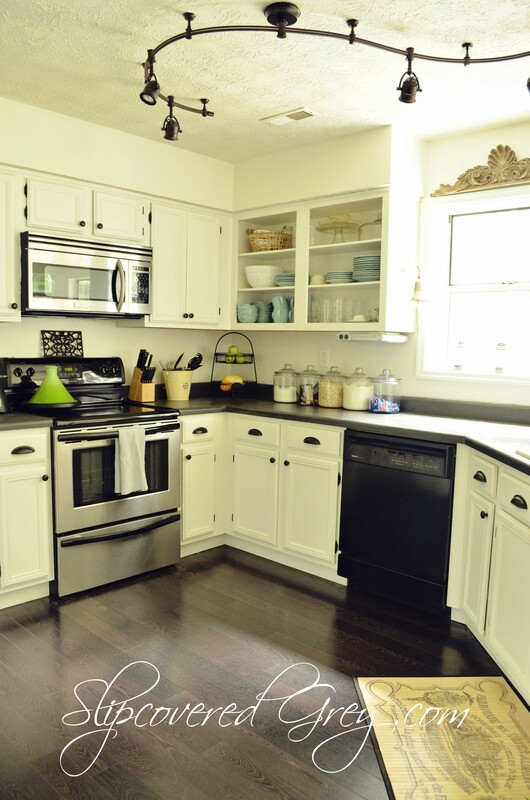 The kitchens I have seen by IKEA are great, they were in two Southern Living Idea Houses that I have seen. Very nice! We used to have a florescent light and replacing it with the track lighting has been great! We do get plenty of light and I like that we can move the lighting where we want it to go. 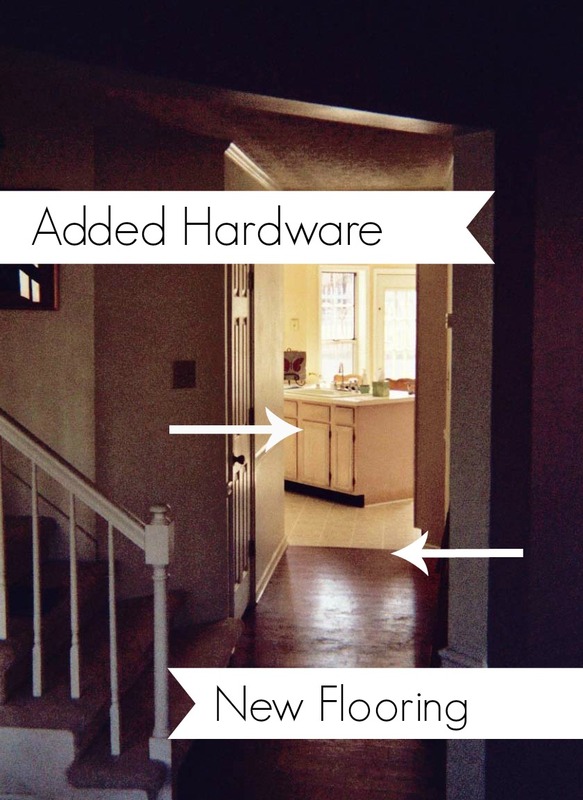 We do not have recessed lighting – I wanted to do recessed, but it wasn’t in our budget. (Sigh). 🙂 Keep me posted on how your kitchen is coming along. I would love to hear. Wow! I LOVE it! You did a fantastic job and I can’t believe it is the same space. 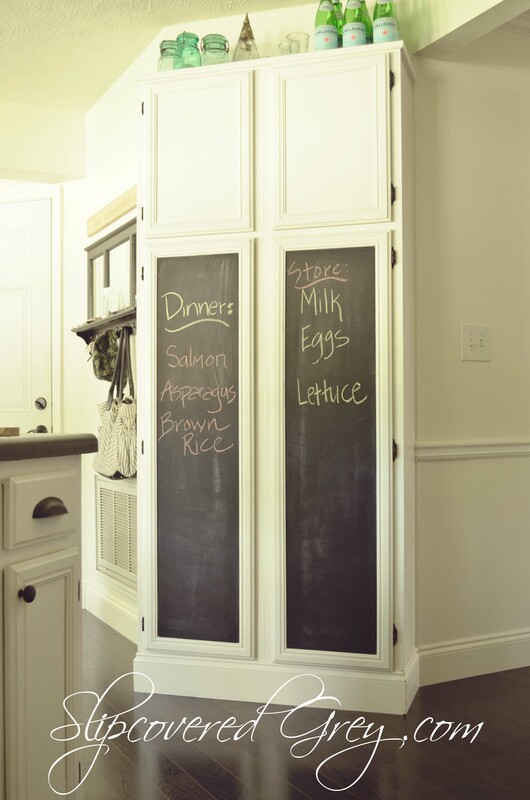 I did the same thing in our old house and it does make a huge impact. I really like your one open cabinet – it looks great. Excellent Job! Your kitchen looks wonderful, Angie. 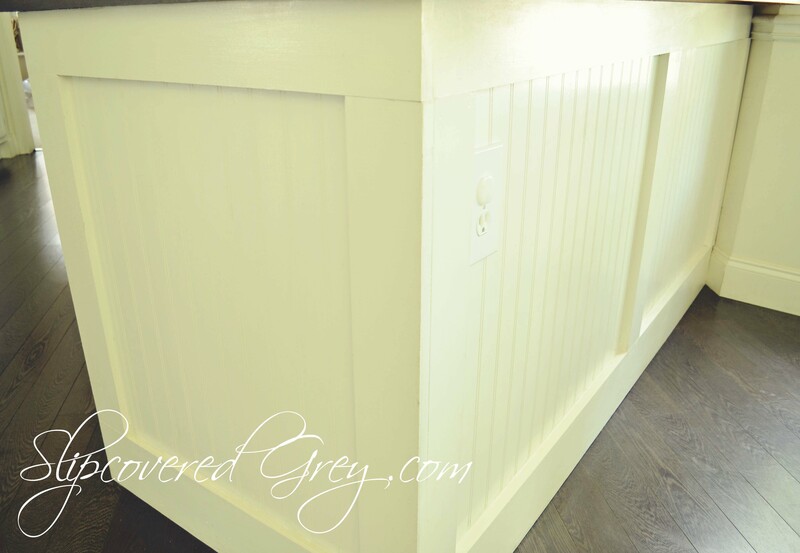 The beadboard and wide trim really adds a wow to the peninsula- great idea! Sheila, thank you so much! Your kitchen looks lovely, you have done an amazing job. 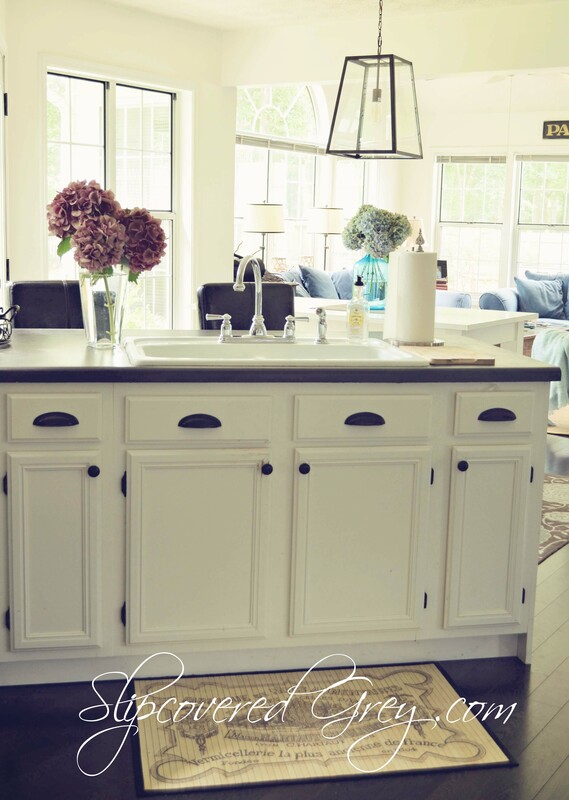 I love the floors and the wooden detail above the kitchen window. I love your kitchen mat has a lovley frenchy feel. I was wondering where you got it? Thanks so much for giving me the details for Beyond the Door. I”m in California, and have looked up the website and will email them. Enjoy your lovely Kitchen, you’ve worked so hard on it and have done an amazing job :0). Relle, if you can’t get in touch with them, let me know. I go there often and I can inquire for you too. 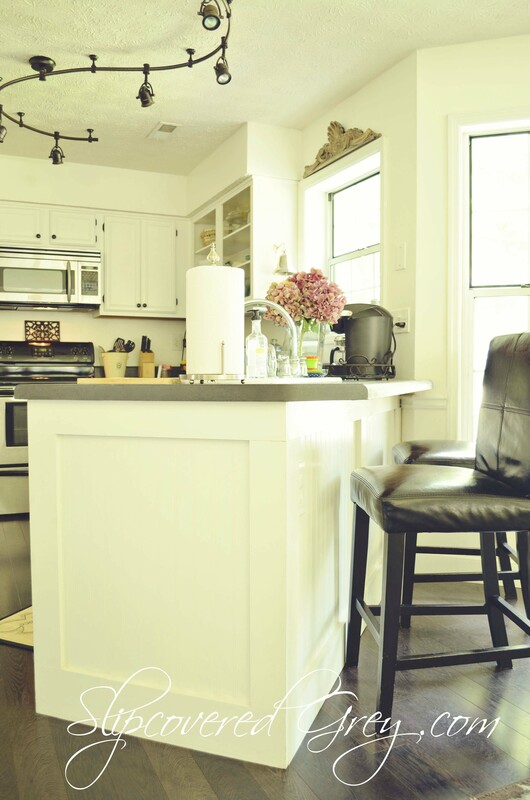 I would love to know how you changed your white laminate counter tops into the darker color slate . Love your blog !! !